1 nedēļas spāņu valodas mācību programma Rondā - ... / Valodu mācību centrs | BaltImage | Angļu, vācu, spāņu, krievu, franču, latviešu un citu valodu kursi - zemākā cena par augstāko kvalitāti! 1 nedēļas spāņu valodas mācību programma Rondā - "Spāņu valoda Spānijā" no 3.- 9.07.2017. 1 nedēļas spāņu valodas mācību programma Rondā - "Spāņu valoda Spānijā"
Kad? - no 3.07.2017. – 9.07.2017. Kas nav iekļauts brauciena cenā? Līdz kuram datumam jāpiesakās braucienam? - Līdz 31.05.2017. 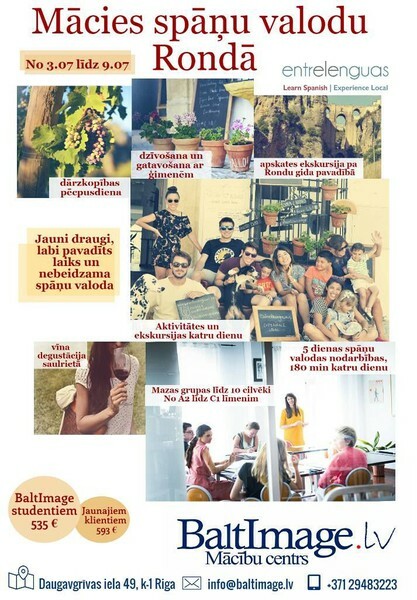 ** Ievēro, ka vietu skaits ir ierobežots, braucienam var pieteikties TIKAI 10 cilvēku grupa! Jo ātrāk reģistrēsies braucienam, jo lielāka garantija, ka tiksi grupā! reģistrācijas maksa/drošības nauda - tiek apmaksāta piesakoties, reģsitrējoties braucienam, saskaņā ar izrakstīto rēķinu. !!! Lūdzam ievērot, ka šī nauda netiek atgriezta, ja kaut kādu iemeslu dēļ atsaucat savu dalību braucienā. iemaksātā atlikusi nauda (472,- EUR) netiek atgriezta, ja atsaucat savu dalību braucienā vēlāk nekā 18 dienas pirms brauciena. * Brauciens tiek nodrošināts sadarbībā ar spāņu valodas skolu Spānijā "Entrelenguas". Mācību centra BaltImage mācību ceļojuma studentu grupai tiek sagatavota īpaši izstrādāta mācību un aktīvās atpūtas programma. Ronda boasts many important historical and cultural sites, such as the first plaza de toros (bull fighting ring) in Spain. The city has been home to the Romans, Arabs, and Christians throughout Spain’s long, varied history, as evidenced by its striking architecture. The city is situated centrally in the Andalusia province of Malaga, just 45 minutes away from the sunny Costa del Sol and very close to Granada and Seville, emblematic cities of Spain’s breathtaking Andalusia. Entrelenguas is a Spanish Language School that seeks to promote Spanish language learning and greater cultural understanding. We offer a broad range of Spanish courses as well as a great variety of 100% local and sustainable cultural, service, and career activities that guarantee the total immersion of the student in our community. Lessons follow a total Immersion Language Methodology Approach with engaging and enjoyable student-centered communicative activities. All of them focus on practising the four language skills: listening, speaking, writing and reading. Lessons (3 hours per day, 15 hours per week ) are based on the four skills of language learning: writing, listening, reading and speaking. Upper levels are mainly focused on the formal and grammatical aspects of the Spanish language, language accuracy and correction of habitual errors of Spanish syntax. Lower levels are aimed at honing speaking and writing skills, and have a special focus on the pragmatic and socio-cultural aspects of the Spanish language. - Ronda Spanish Tour: Discover Ronda with our official tour guide, learn about the history of this beautiful city and how it has changed over the years, and unearth the places that only locals know. - Movie Night: Relax and put your feet up in our centre while watching a Spanish film. This is a great opportunity to meet other students and members of the community and forge friendships in a relaxed and friendly atmosphere. - Hiking: Ronda has a wide variety of hiking trails that run along beautiful vineyards, colourful fields and breath-taking cliffs. The best way to discover the wild side of Ronda is through conversations with hiking enthusiasts who will transform these unforgettable routes into a fun and communicative lesson outside the classroom. - Gardening: You’ll gain an insight as to what it is to work on an organic garden here in Ronda with local gardeners and you’ll learn how to grow delicious organic vegetables and sweetsmelling flowers. - Farewell Potluck with host families and students: This event takes place in our centre. Each student will make a traditional Spanish dish with their host family, bring it with them and share their creation. - Samsara Sunset: This vineyard is located in the valley and has a breathtaking view of Ronda’s famous bridge. Here, you’ll have a tour of the vineyard, learn about the production of this wine (and how it tastes, of course!) and enjoy some local meats and cheeses. Watch the sunset and see how the sky comes alive at night. A key component of the student’s cultural transition will be living with a Spanish family. Students essentially become an adopted member of the family, eating two meals per day with them and sharing in their daily lives.